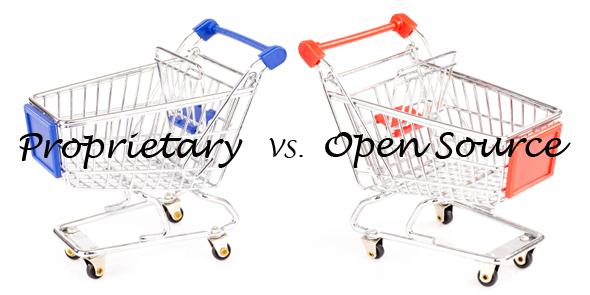 Open source or proprietary solutions for an enterprise ecommerce platform? Proponents on both sides have been hashing it out for years in a partisan like debate over who’s right and who’s better. Since the topic pertains to HotWax Media directly I thought I’d chime in with my own high level slant on the conversation. There’s a good chance that at one point or another we’ve all made a purchase that was influenced by the trust associated with a big name. That’s what credibility and branding is all about. So it only makes sense that one of the top reasons an enterprise would invest in proprietary software is the availability to vendor services and the sense of security that comes with it. And it’s true that signing a contract and paying a licensing fee with a large vendor will undoubtedly provide a crew of qualified people to initiate the system change and then be available on the other end of a phone call in the event of a problem. A nice yet costly reassurance. It’s also widely perceived that along with a proprietary solution comes ease of deployment and long term stability based on trust, along with the notion that the software will naturally improve business functions. But it seems to be a dubious illusion that a big name behind the service means it’s the best available option. This is where most proponents of open source would begin to argue the strongest selling points of an OS solution: the low price tag, access to the source code and availability to highly customizable features. No doubt these factors weigh heavily in favor of an open source solution when establishing an enterprise ecommerce platform, but in the interest of making a rebuttal I’ll weigh this section directly against the strengths of a proprietary solution mentioned above. First of all, community driven equates to community assisting. When people argue that there is no support for an open source solution it’s simply not true. The support available to most open source projects generally consists of a vast pool of contributors and engineers who not only have the ability to provide assistance from anywhere, but who also have a vested interest in the success of the software. This makes for some of the best resources available for sustaining an enterprise level CMS. Secondly, the idea that ease of deployment is a more fluid process through a name brand vendor is also a bit of a misnomer anymore. Implementation is merely a snapshot in time, but one that can carry the distended costs of doing business with a proprietary firm. Given the access to companies like HotWax Media that specialize in open source enterprise ecommerce platforms, the challenges that can be associated with implementation are more or less balanced between the two options. There was a time that corporations dominated at the enterprise level, but the dogma of name brand proprietary solutions having a sizable advantage over its open source contenders is backward thinking. That’s not to say that there won’t always be a demand for both options, and generally the end result of increased competition is better product offerings. The bottom line about choosing between open source and proprietary solutions is this: don’t make a decision based on the status quo, make it based on the solution that best suits your business requirements. Understanding the needs of your organization and the capacity to manage a new platform will help guide a good decision.